A lot of great Call of Duty moments occurred this weekend in Columbus. We’ve seen a lot of great plays over the past two weeks of the Call of Duty World League Global Pro League—and last weekend definitely didn’t disappoint either. Group Yellow featured eUnited, Splyce, Red Reserve, and Rise Nation, and just like the two previous weeks, it all came down to the final match to see who would take home the top spot in this group. This weekend featured a wide variety of unique plays, from collateral sniper shots to insane ninja defuses. And, of course, everyone’s favorite moment from the weekend—James “Clayster” Eubanks getting pumped, and lightheaded, after eUnited secured first place. Although this was a remarkable moment, there wasn’t just one individual play that led to Clayster’s outburst, which means it didn’t make our list for this past weekend. Here are the top five plays from Group Yellow of Stage Two in the CWL Global Pro League. In the final match on Sunday night, eUnited had already secured first place in Group Yellow when they won the first map against Splyce. But obviously they wanted to win more than just one map against the kings of Europe. Facing a 2-0 series deficit, Splyce was also down 3-2 on Throwback Uplink with just 20 seconds remaining. They tried to make two one-point throw attempts to force overtime—but Alec “Arcitys” Sanderson wasn’t going to let that happen. Arcitys intercepted the first throw and reset the drone back to the middle of the map by throwing it out of bounds. With just eight seconds left, Splyce used their Overdrive payload ability to increase their speed for one last scoring attempt, but Arcitys also intercepted that throw to seal the series sweep for eUnited. This was an impressive defensive display from Arcitys, especially in eUnited’s dominant performance over the best team from Europe. Who doesn’t love two-for-one sniper shots? In the second battle between Rise Nation and Splyce on Sunday, Rise’s Brice Faccento showed off his sniper prowess with a collateral kill on Jordan “Jurd” Crowley and Dylan “MadCat” Daly. The only reason this great shot is so low on our list, however, is because Faccento wasn’t being watched on stream when it happened—so we only have Jurd’s point-of-view of this shot. But, if you look closely at the minimap when the kills happen, you can see that Jurd and MadCat are perfectly lined up in the middle hallway on Retaliation. Although it’s unfortunate that we didn’t get to see Faccento’s point-of-view for this insane sniper shot, it was definitely unique to see the other perspective of a collateral kill. Faccento makes our top plays list once again, but he’s on the opposite side this time around. EUnited was up 2-0 against Rise Nation in the opening Group Yellow match on Friday, when Clayster showed off his boxing skills. Clay was inside of Blue on Frost Uplink when Faccento came up behind him for what most people would expect to be an easy kill. Clayster, however, wouldn’t go down so easily. The Call of Duty veteran turned on Faccento, jumped in the air, and hit him with a left hook to secure the kill. You don’t always get to see players spin 180 degrees to get a melee kill, but if anyone can do that, it makes sense that it was Clayster. We’ve seen a lot of buzzer beaters in Uplink lately, and this weekend was no exception. EUnited secured the first seed in Group Yellow by taking down Red Reserve 3-0 on Sunday—in part thanks to Preston “Prestinni” Sanderson’s clutch dunk on Frost Uplink. The third map in this series was tied at 6-6, and with just about 12 seconds remaining in the game, Prestinni got possession of the drone. Prestinni actually got stuck running for his life, and had to throw the drone down to reset his armor, but with seven seconds left, he used his Active Camo payload ability to go invisible. Three players on Red Reserve frantically tried to body-block the Uplink portal so Prestinni couldn’t score, but he patiently waited for his opportunity to strike and punched in the two-point dunk just before time expired. Some other players might have got nervous or tried to make a one-point throw in that situation, but Prestinni stayed calm, cool, and collected to help eUnited earn the sweep of Red Reserve and secure the top spot in Group Yellow. Even though they didn’t qualify for the CWL Stage Two Playoffs, Red Reserve still put on quite a display in Search and Destroy—especially when it comes to ninja defuses. In Call of Duty, a ninja defuse is when a player on the defensive team sneakily tries to prevent the bomb from detonating while players on the offensive team are still alive. This is exactly what Rhys “Rated” Price did against Rise Nation on Friday. Red jumped out to an early 2-0 series lead, but Rise bounced back and won two straight maps to force a game five on Breakout Search and Destroy. But Red dominated the Search and Destroy map, and built a 5-1 advantage heading into the seventh round. In this round, however, Rise slayed half of Red Reserve and planted the bomb. Instead of going for all four kills, Rated wisely chose to go for the ninja defuse while his other teammate died. Seven-and-a-half seconds later, Rise finally found Rated, but it was too late. Rated’s one-on-four ninja defuse for the map and series win against Rise definitely deserves the honor of being our top play from Group Yellow. The final week of the regular season for Stage Two in the CWL Global Pro League will begin this Friday, July 21—and it could be the best week yet. 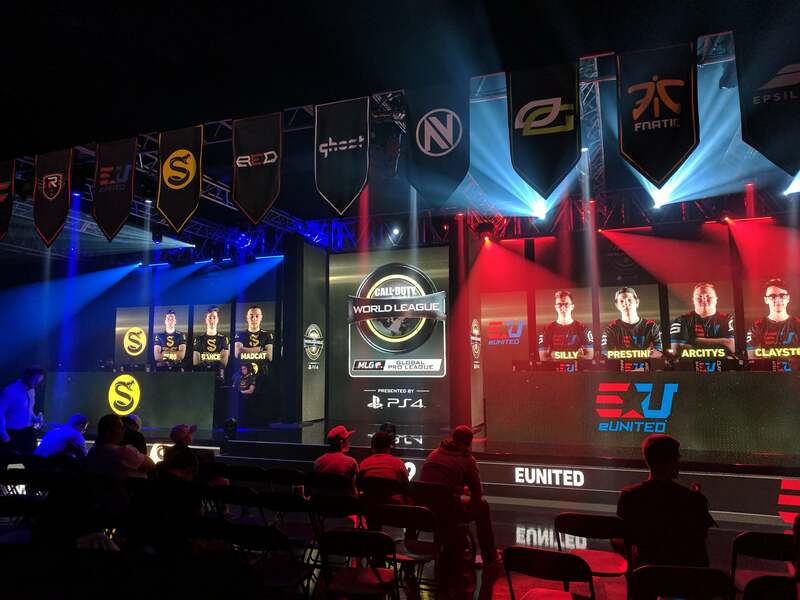 Call of Duty fans are anxious to see what great plays Group Green can deliver when powerhouse teams like OpTic Gaming, Epsilon Esports, Cloud9, and Team EnVyUs all travel to Columbus, Ohio this weekend.